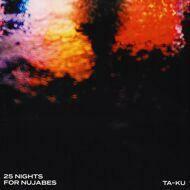 Teaming up with Jakarta Records on the 823 joint label venture, Ta-ku is sharing his now classic ’25 Nights For Nujabes’ project as a digital / vinyl release alongside two completely new Bonus Tracks - both featuring Toronto based producer Matt McWaters. Drawing inspiration from the likes of D’Angelo, James Blake and J Dilla, Matt McWaters fuses modern electronic production with soul and indie undertones. A love for smooth basslines, soulful keys and catchy melodies allows him to carry out his vision with every track.